Tonight at 1900 UTC, the Volvo Ocean Race fleet remains tightly bunched, with no clear strategy at this stage of the 5,430 nautical mile (nm) leg from Cape Town to Abu Dhabi. The decision to split from the pack and take the low road to the south has yet to be taken and, as always, the weather Gods are in control. It will be conservative sailing until the crews are forced to declare their plans, perhaps overnight, or tomorrow morning. “Our weather strategy is in pieces now as the fleet has failed to catch the low pressure as planned and I suspect we will all sit waiting for a new westerly wind to pick us up in the next day or two,” explained Ian Walker/GBR, skipper of Abu Dhabi Ocean Racing’s Azzam earlier today. Onboard Sanya Lan, skipper Mike Sanderson/NZL and his Norwegian navigator Aksel Magdahl are closely huddled, considering the dilemma of adopting a more southerly route or continuing to hug the African coast before hooking into a little low-pressure system and then charging south. “Fingers crossed we aren’t parked for as long as last night,” Sanderson said hopefully. However, in contrast to the last 24 hours, the sentence of no wind has been lifted and the frustrating drifting conditions have been replaced by a positive southwesterly breeze, allowing the six teams to crack sheets and reach nicely at between 16 and 17.5 knots. Groupama 4 (Franck Cammas/FRA) leads the field by just over one mile from CAMPER with Emirates Team New Zealand (Chris Nicholson/AUS), however this pair are only 17 nm offshore and the chasing pack is seven miles to leeward. 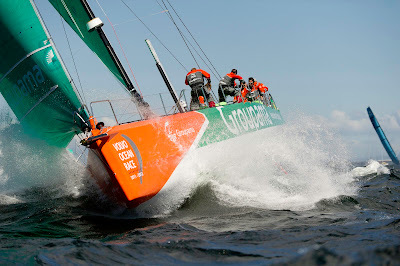 Overall race leader, Telefónica (Iker Martínez/ESP) is 21 nm astern in sixth place, but has gained four miles over the past three hours, while Azzam records the highest average speed of 12.9 knots.